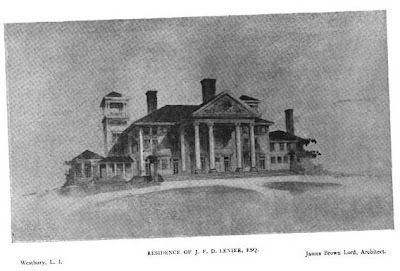 The estate of James Franklin Doughty Lanier, built c. 1891 by James Brown Lord in Old Westbury. Lanier was a financier and member of the firm of Winslow, Lanier & Co., one of the oldest private banking houses in the country. He was one of the first members of the Meadow Brook Hunt Club and his obituary calls him one of the pioneer automobile drivers in the country. The house was later owned by Charles Steele who gave it an extensive remodeling and was eventually demolished when his grandchildren built a new house on the site. looks like pre-Trumbauer but i like the tower, the porch gazebo and some of those little touches they seem to have forgotten about after the turn of the century. proportions would be more at home south of the md line but still very impressive. do we know where it was and any actual pix or interiors? There are two B&W photos of the exterior in the SPLIA book 'Long Island Country Houses & Their Architects'. I'm still looking for some I can post and I have yet to pinpoint the location of the house on a map. The estate is located at the intersections of Steel Hill Road & Hitchcock Lane. If you zoom in, you can see part of the old garden retaining wall south of the new house which replaced the old one in the 1920's or early 30's.